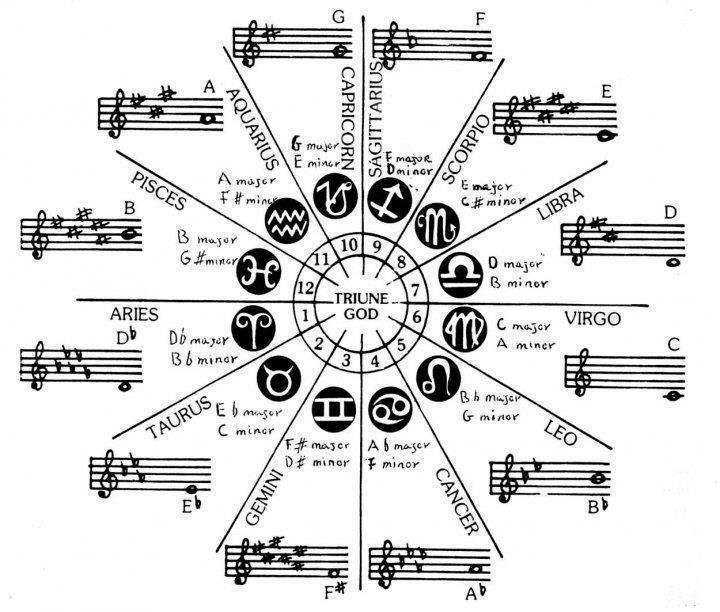 If one were to think in terms of musical frequencies emitted by each planet in a specific sign, a person's horoscope would make a specific kind of harmony or music. Then, when brought together with others (people or even planets that continue to move through time), the music would be either enhanced or become cacophonic. In fact, the music is constantly encouraged to adapt and rearrange itself to fit the stronger pattern. Johannes Kepler (1561-1630) spoke convincingly of the harmony that permeates the universe, extending the work of Pythagoras and the theme of "music of the spheres". Pythagoras defined music as the perfect union of contrary things, as unity in multiplicity, oraccord in discord. Indeed, music does not only coordinate rhythm and modulation, but imposes order on the whole system. Pythagoras discovered that the pitch of a musical note changed if the length of a piece of string was stopped half way along. This created an octave that produced the same quality of sound as the note produced by the unstopped string, but it vibrated at twice the frequency. The Pythagoreans used music to heal the body and elevate the soul. In ancient cosmology the planetary spheres ascended from Earth to Heaven like the rungs of a ladder, with each sphere said to correspond to a different note on a grand musical scale. Traditional astrology recognises five significant relationships based on the twelve-fold division of the zodiac signs, their significance being derived by analogy with the ratios of the musical scale. Thus the conjunction is equal to two notes played in unison, dividing the circle into the ratio 1:2. Not confining himself to zodiac signs alone, Kepler looked into the theory of harmonics and extended the analogy of the musical scale. He alerted astrologers to several new aspects, such as the highly creative quintile and biquintile series, as well as the sesqui-quadrate. Three laws of planetary motion: Kepler is most famous for formulating his three laws of planetary motion, which made a fundamental break with astronomical tradition and superseded the ancient Ptolemaic concept of a spherical universe with an epicyclical motion (around the Earth at the centre). In 1609, in Astronomia Nova ("New Astronomy"), Kepler announced in his first law that the orbits of planets were elliptical, not circular. In his second law he stated that the speed of a planet varied at different stages of its orbit. His third law was published in 1618 in Harmonice Mundi ("Harmony of the Worlds" - adding to Pythagoras' theme of the music of the spheres). The third law established that there was relationship between a planet's distance from the Sun and the time it takes to complete an orbit. For more info join the Lifting The Veil Facebook page. Is it not interesting that various frequencies are playing in into various aspects in our lives? Just taking the Schumann Resonance is one of great importance, too. Once that is disturbed, illnesses are starting, due to the imbalances of the resonance and frequencies concerned.